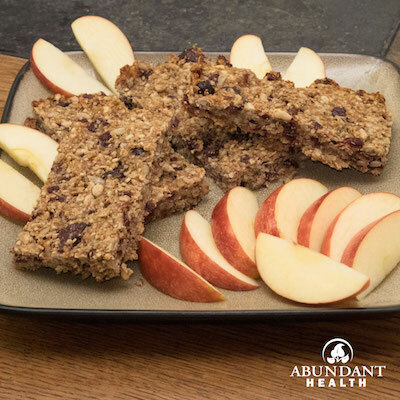 Do you need a quick and healthy snack for when you are running out the door? Even if you just need something healthy to nibble on when you get hungry, these pumpkin chocolate chip granola bars are just the thing for you! Go ahead and give this delicious and hearty snack a try! Preheat your oven to 350 degrees Fahrenheit. Lightly grease an 8.5″ x 12.5″ baking pan, and line it with parchment paper. In a large bowl, mix together the pumpkin, vanilla, maple syrup, and essential oils. Using a food processor, pulse the rolled oats a few times until they are coarsely chopped but still have lots of texture. Stir the oats into the pumpkin mixture. Place the walnuts and almonds in the food processor, and pulse until coarsely chopped. Add the chopped nuts, chocolate chips, sunflower seeds, pepita seeds, chia seeds, sea salt, and pumpkin pie spice to the pumpkin oat mixture. Stir until well combined. Spoon the mixture onto the prepared baking dish, and press it down evenly across the baking dish until smooth and compacted. Bake for 25–35 minutes, or until firm and lightly golden colored along the edges. Let cool for 10 minutes in the pan; then lift the parchment paper with the granola bar slab out of the pan, and place it on a cooling rack to cool completely. Once the granola bar slab has cooled, slice it into bars, and enjoy! Store any remaining bars in a bag or air-tight container in the fridge or freezer.